I created a few recipes for Foodbuzz a while back, but haven't talked about them at all. It was part of a compensated feature for Foodbuzz' Tastemaker program, partnering with Newman's Own, so a few of the recipes will feature Newman's Own ingredients. Up first, though, is my recipe for spring rolls with a lively, bright filling. The filling consists of mushrooms and avocados, two hearty ingredients to give the rolls some sticking power. There is no cooking involved, except for the peanut dipping sauce, and it comes together very easily. It would be the perfect appetizer to make for your Labor Day party. If you'd like a non-vegetarian version, try my Lentil Sprout Spring Rolls with Shrimp. The easiest way I've found to make the wrappers pliable enough to roll is to lightly spread the sheet with water, using a pastry brush. 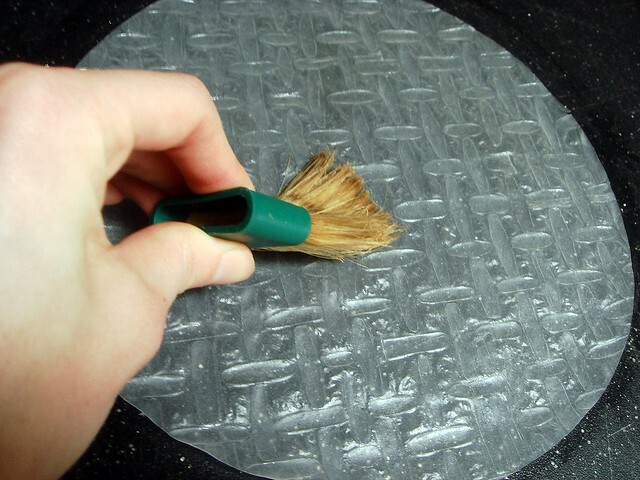 As the wrapper soaks in the moisture from the water, it becomes easier to wrap and stick onto itself. Lightly brushing it is the key. You don't want the wrapper to become translucent, or else it will be too flimsy to roll up easily. Layer the ingredients on the bottom third of the wrapper. 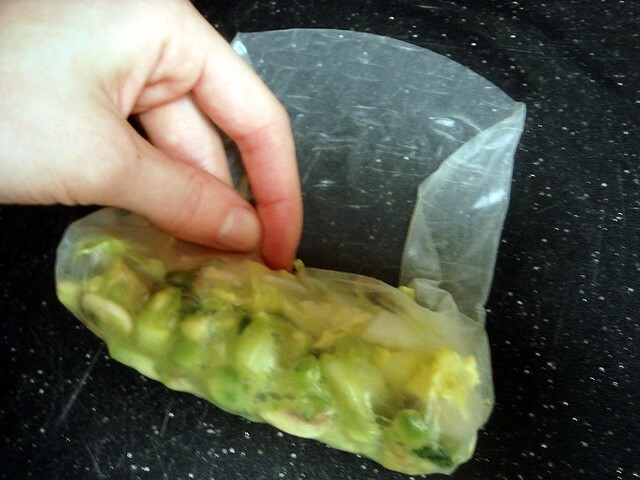 >Before you begin to wrap, fold both the sides over the filling to keep it from spilling out. This also helps you roll a tight, neat spring roll. Begin wrapping the bottom wrapper up, folding over the ingredients and compressing with your fingers. Continue folding the roll up, tucking it into itself after each turn. And you're done! 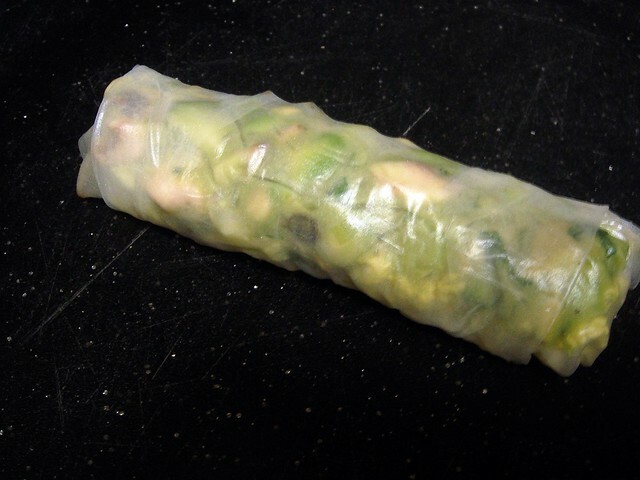 If you wrapped the spring roll tightly enough so that the filling is compacted, you should be able to slice the roll in half without much of the contents spilling out. Practice makes perfect! Vegetarian spring rolls with a marinate mushroom, avocado, and cucumber filling. Works well for a main course or as appetizers. Toss together chopped mushrooms, avocados, cucumber, green onion in a medium bowl with cilantro, rice wine vinegar, olive oil, lemon juice, sesame oil, salt, and white pepper. Cover and chill for 20 minutes. In a large bowl toss cabbage, bean sprouts, and chopped jalapeno together. In a small saucepan over medium heat, place vegetable broth, peanut butter, soy sauce, and ginger. Whisk together until peanut butter blends with broth into a smooth paste. Reduce heat to low and cover. Fill a small bowl with water and set it near your workspace with a pastry brush. 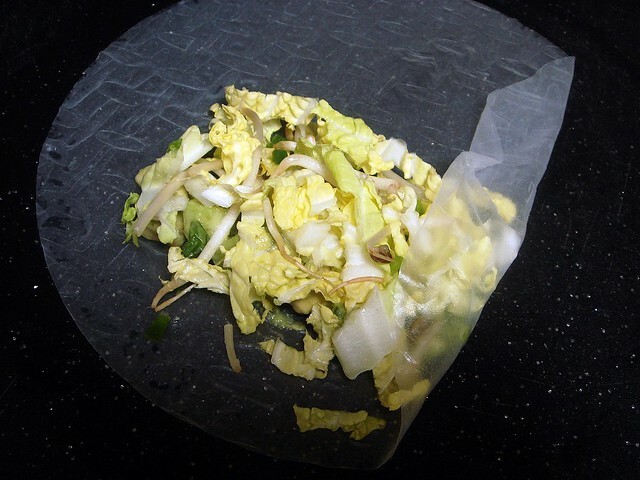 Place spring roll wrapper onto work surface. Dip pastry brush in water and brush both sides lightly with water. Let stand for 15 seconds. 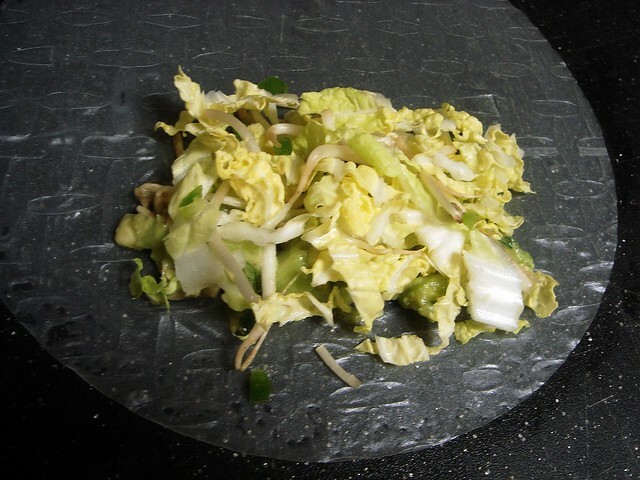 Dollop 1/8 cup avocado filling 1 ½ inches from bottom edge; top with ¼ cup napa cabbage mixture, spreading about 1-inch from side. Fold both sides in, then fold bottom edge up and over filling, tucking carefully. Continue to roll and tuck until rolled completely. Place on serving platter. Repeat with remaining wrappers and ingredients. 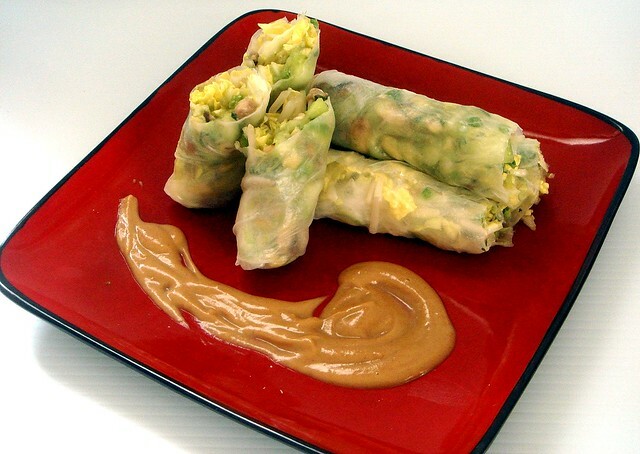 Serve with warm peanut sauce. Special Notes: Wrappers with both rice flour and tapioca starch are preferable. You're speaking my love language here with these! Yummy! Thanks for the tutorial--I love spring rolls but have never tried to make them at home! You know who was a vegetarian?